Heat gas or charcoal grill. Remove pie crust from pouch; gently press crust in bottom and up side of 8-inch cast-iron skillet, leaving crust overhanging edge of skillet. Spread grapes in crust. Sprinkle with granulated sugar and salt; drizzle with wine. Gently stir to mix and coat grapes. Sprinkle with almonds. Fold crust over filling to form 1 1/2-inch rim around top, leaving filling uncovered in center. Brush crust with egg; sprinkle with sanding sugar. Place skillet on grill over medium-high heat. 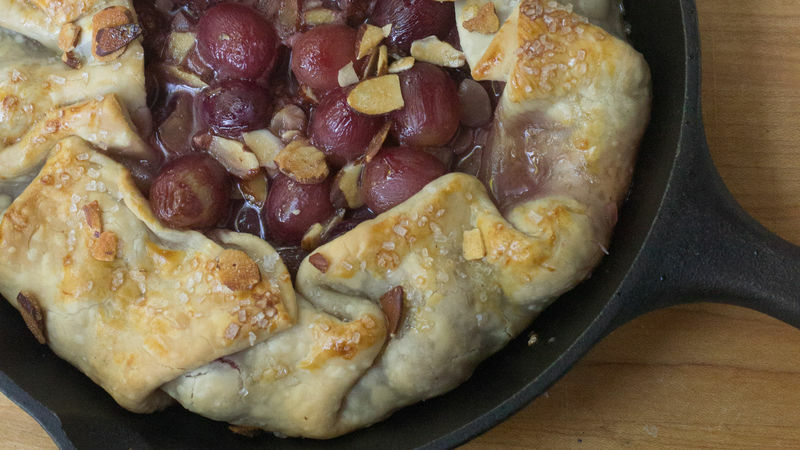 Cover grill; cook 20 to 25 minutes or until crust is golden brown and grapes are softened. When folding the crust over, fold it a few inches at a time, forming a rustic pleated edge. Serve this sweet and juicy pie with ice cream or Greek yogurt drizzled with honey.